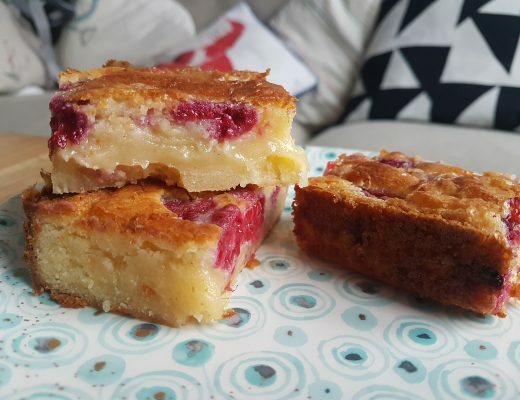 Over the past couple of months I have been experimenting with gluten free polenta and trying out some new savoury recipes, after years of largely using it only for baking. 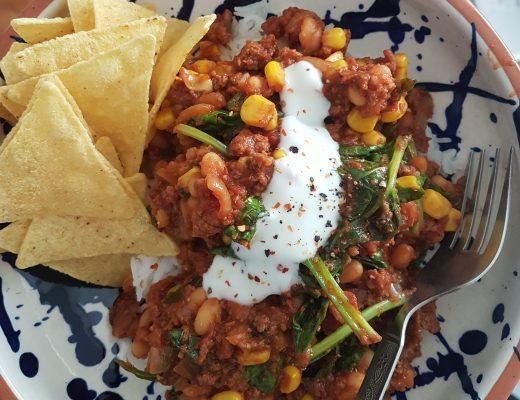 This comforting dish is one of my favourites so far. 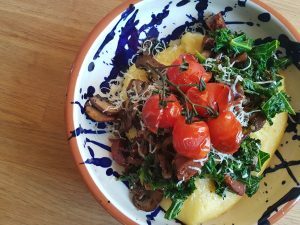 Soft buttered polenta on a bed of kale and red onions, topped with garlic pan-fried mushrooms, parmesan shavings, black pepper and oven-roasted cherry tomatoes. 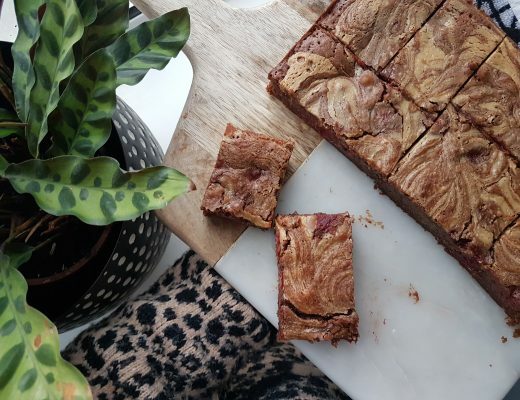 It is quick to whip up, full of good nutrients and will leave you with a very happy tummy. Note, while polenta is naturally gluten free, some varieties are not suitable for coeliacs due to production methods. Check the packet before you buy and it should specify whether it is milled on the same line as gluten-containing ingredients. 50-70g of quick cook gluten free polenta, depending how hungry you are! 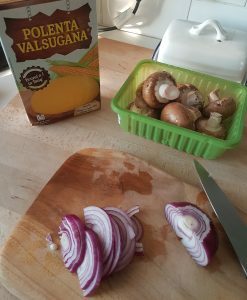 I use Polenta Valsugana, which is a gluten free polenta brand and lovely and fine. It is available from Waitrose, amongst other places. 2 tsp herbs – any mix of basil, parlsey, thyme, and oregano (dried or fresh). 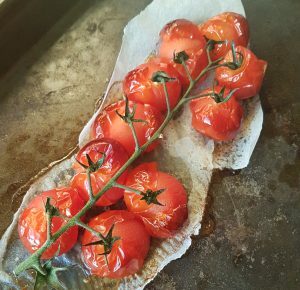 Heat oven to 180C, then place cherry tomatoes on a baking tray and roast for 15 minutes. Peel, halve and finely slice a red onion – cook in olive oil in a frying pan over a low heat until soft and translucent. Heat a small pan and add the butter and olive oil. Once the butter has melted add the herbs and half the garlic and cook over a low heat for a couple of minutes. Wash and slice your mushrooms and add to the pan to cook over a medium heat until the mushrooms are soft. Take a second small pan and cook your gluten free polenta according to the packet instructions. Add the water gradually to prevent clumping and give it a good stir. You know it is ready when it starts to stick together and come away from the sides of the pan. Season with salt and pepper to taste. 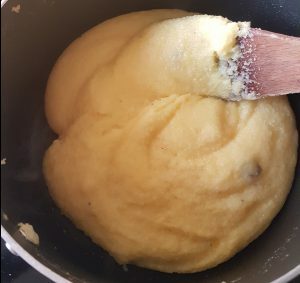 I like to add a little knob of butter, as it gives the polenta a lovely silky consistency. Your tomatoes should be done now, so take them out of the oven and place to one side. Back to the frying pan – add the remaining garlic to the onion, cook for 1 minute, then add the kale. Turn up the heat a little and fry until the kale is bright green and slightly softened. 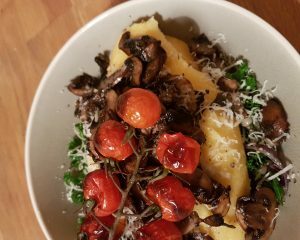 To serve, create a bed of the kale/onion mix, top with the soft gluten free polenta, then spoon the mushrooms over the top. Place the cherry tomatoes on top and grate over a little parmesan and some black pepper.